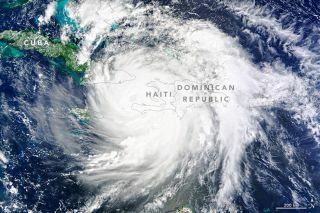 NASA’s Terra satellite acquired this image of Hurricane Matthew on Oct. 4, 2016, the same day it made landfall on southwestern Haiti as a Category 4 storm. At the time, Matthew had top sustained wind speeds of 143 mph (230 km/h). New satellite photos show huge Hurricane Matthew churning its way through the Caribbean toward the Florida coast. On Tuesday (Oct. 4), NASA's Terra satellite captured Matthew's swirling clouds blanketing Haiti, the Dominican Republic, Puerto Rico and much of eastern Cuba. As of Wednesday afternoon, Matthew had weakened slightly, to a Category 3 hurricane with sustained winds of around 120 mph (193 km/h). The storm was moving slowly northwest through the Bahamas, with another landfall predicted to take place along Florida's east coast on Thursday night (Oct. 6) or early Friday morning (Oct. 7). Matthew is currently gaining strength, and experts said they think it will intensify into a Category 4 storm once again before hitting Florida.